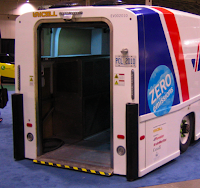 This weekend at the Green Living Show in Toronto I had the chance to talk to the developers (Unicell) of the zero emissions delivery truck. The truck is fully electric and has some more features that are really impressive. As I understand correctly, Unicell was approached by Purolator to develop a modern delivery truck for urban zones that is not only economical, but also much healthier for the operators and the environment. First, the team observed what a delivery truck really does in one day of operations and they found out that the truck only drives for about 60 km’s and makes about 200 stops in 10 hours per day. The team built a fully electric truck, that kneels and has very low ground clearance, eliminating the steps that the operator/deliverer needs to take every time he walks into and out of the old style (box) trucks. This reduces the wear on the driver, speeds up his work day and the reduces the risk of injury (therefor also the down time of sick operators, which is very costly in a large company). The doors also open and close automatically, which enables the operator to use a two wheel dolly of and on the truck. The truck was used for 7 weeks in the fall of 2007 and all the operators really liked it. The batteries for the electric drive train never ran out. This truck is a very good example of a company that thought an old concept through and created a product that is much more economical, and healthy for employees and the environment. The following videos show the truck in action. I would also like to add, that Purolator also uses another company called Azure Dynamics to retrofit their already existing fleet of box trucks to be hybrid diesel trucks, which cuts down on the carbon footprint of the fleet. Last but not least, here is some food for thought, for some really advanced environmental solutions. The team from Unicell explained to me that these kind of trucks can be used for a very advanced electrical grid. This is a very theoretical scenario, but very possible in the future. One of the problems of having an electrical grid that relies on wind, hydro-electric and other renewable energy sources is the availability of the power in the grid. If the wind happens to blow a little less and therefor not provide as much power as needed, some energy needs to be stored. This is where a large fleet of these kind of trucks comes in: In an extremely smartly designed electrical grid, the electric batteries in the trucks can provide power back into the grid. It is very well possible to know, that the trucks don’t need the energy stored in the batteries at a certain time (ie: on weekends or at night) and feed it back into the grid and still be fully charged by the time the truck is needed.